Help: Do i have to activte any Captcha Types when using with GSE SER? — . :: GSA SEO & Marketing Forum ::. Do i have to activte any Captcha Types when using with GSE SER? all captcha types are activated by default, but you may want to uncheck some captchas to save some CPU like recatpcha, mollum, kcaptcha for example with very low to none solving rate or skip them with a setting to 'only try to solve if cuccess rate is at least' 10% or so. Second question: As seen on your screenshot. The webserver i don't need when working with GSA!?! no, with SER only it will communicate without any webserver. is there any manual for CB? what setting should i use for SenukeX? I'm not sure about the Webserver option but i think this is needed to communicate with all tools which needs to simulate a captcha service. The second option is mandatory though, because SEN or Sick do convert all captcha image to JPG-format, so CB can't detect them according to their original file type. thanks Ozz.. wow..CB is working like charm with Senuke..I have already got almost 20% more accounts created on Senuke with CB..
@ozz My CB came default with DeCaptcher and DeathByCaptcha clicked. I use SEnuke and GSA. Should I leave it like that? yes, 'simulate' will modify your host file so its working with the captcha service you've choosen in SEnuke (or any other tool). GSA Captcha Breaker is not running or not responding. 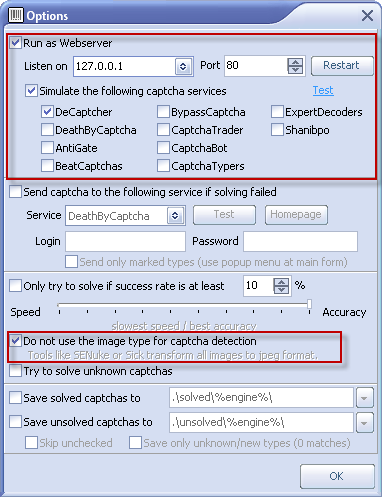 I have to check Webserver and Simulate captcha services in CB and use captcha service in SER.